The story is simple. Carol details a relationship in the 1950s. In this case, between Carol Aird, an elegant society woman who resides in the upscale suburbs of New Jersey and a struggling young salesgirl named Therese Belivet who works in a Manhattan department store. Carol is going through a difficult divorce while trying to maintain custody of her child. In contrast, Therese, who is at least a decade younger, is on the precipice of a new life with her fiancé. This pair couldn’t be more different. In fact Carol is a reflection in contrasts. Certainly there’s the social disparity – that these women from two different worlds would seemingly have little in common. But then, more importantly, there’s the departure from what convention allows and from what their heart compels them to do. The narrative is a study in desire. Initially, Carol’s chance encounter with Therese occurs while buying a gift in the toy department. What follows is a tastefully polite discussion that belies an attraction that is hinted at but not acknowledged, at least not immediately. The conversation ignites a spark that draws them ever closer. Cate Blanchett is beautifully vague at first. A refined creation with curved blonde hair styled in waves, bright red lips against her porcelain skin, wearing a scarlet dress and hat to match, ensconced in fur. Rooney Mara is waifish and shy. Doe-eyed and timid, her beauty suggests Audrey Hepburn in the face, but frostier in temperament. Perhaps the delicate visage of a young Jean Simmons exuding a curious intensity that hides a pain she cannot discuss. Given the two leads, the scene, as well as the entire film, is also a contemplation on etiquette between the mores of society and the amorous impulses that cause people to deviate from what is considered accepted behavior. 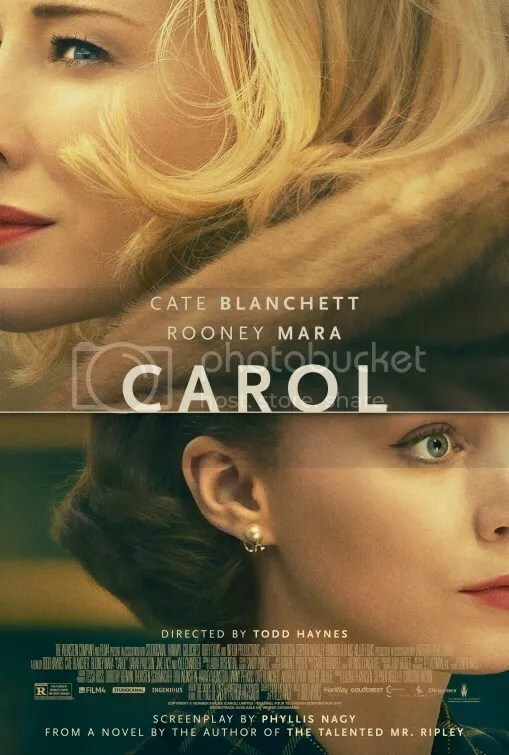 Carol is an adaptation of a Patricia Highsmith (Strangers on a Train, The Talented Mr. Ripley) bestseller. The Price of Salt was the renowned author’s second publication. Although back in 1952, it was originally published under the pseudonym Claire Morgan due to the book’s unconventional content. Sold in drugstores and mass-marketed as pulp fiction, it was priced at $0.25 and branded with the tagline “The novel of a love society forbids”. The idea was actually motivated by an incident in the author’s own life while working at Bloomingdale’s, a job that lasted a mere two weeks. The inspiration was real, the subsequent relationship however was a fabrication. Nearly forty years would pass before Patricia Highsmith would even admit to being the publication’s true author. Todd Haynes’ sumptuous adaptation is a luxurious rumination that defines cinematic art. The director is truly in his element. This is very much a companion piece to his 2004 period drama Far From Heaven, a film that grafted a modern theme onto the kind of movies that Douglas Sirk made. What made those “women’s pictures” so evocative was the way they mined feeling as some sort of majestic gesture. Those grand, gorgeously expressive melodramas were ardent soap operas. Carol is an exquisite drama that manages to capture a moment in time, not as it really was, but how we romanticize it to be. The polite nod, the gracious smile, the unspoken thought, all confirm a cultivated behavior that complements a rich visual tableau. Whether it be costumes so luxe, you can almost feel the fabric’s texture or a set design so vibrant, you believe you could step right into the frame, the display is presented with such incredible detail the screen positively bursts with the spirit of the age. Composer Carter Burwell’s score creates an elegiac mood with strings and woodwinds. Jazzy tunes of the era are peppered throughout. The whole experience is that you’ve actually unearthed some long lost work, rather than watching an idealized recreation. All of this would be for nothing if it didn’t have personalities to give the production life. Blanchett and Mara own the drama. They alone carry the thrust of the chronicle on their talented shoulders. The picture belongs to both of them. While they occasionally behave as if what they’re doing is no big deal — odd given the time period — they both captivate the viewer with their bewitching performances. 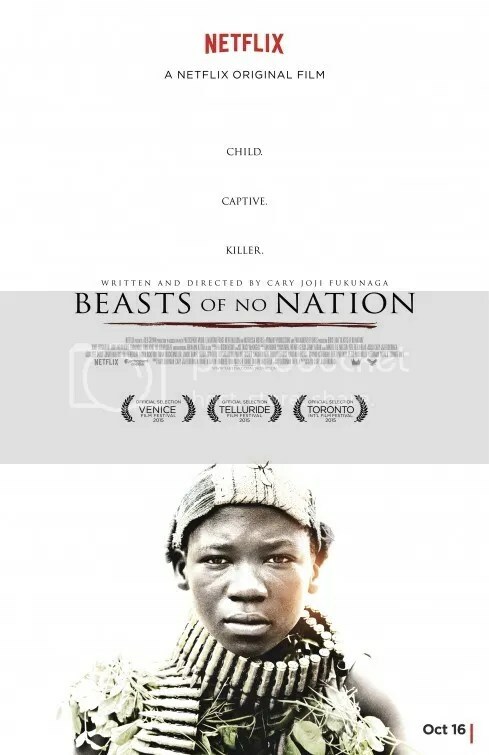 The film positively aches with their emotion. Splitting author Suzanne Collins’ third and final book into two parts was a decision motivated by greed. The choice may have made stockholders happy, but it certainly didn’t benefit the art of telling an interesting story. 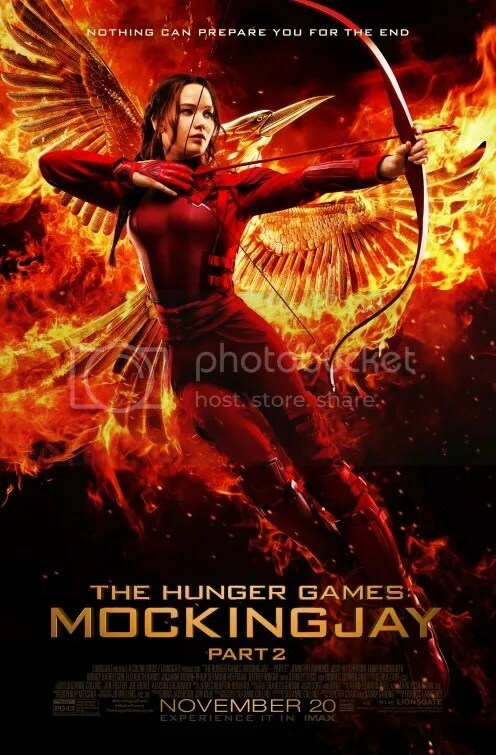 Mockingjay Part 1 relied on exposition to set up a civil war that was brewing. The subject continues in Part 2. The ruthless enemy is Coriolanus Snow (Donald Sutherland), President of Panem. The rebel factions from the outer districts take orders from Alma Coin (Julianne Moore), President of District 13. Katniss Everdeen (Jennifer Lawrence) is still on the side of Coin but she’s clearly conflicted to be an instrument in furthering her motives. Katniss is no longer a valiant participant in the games. She’s the Mockingjay — an inspiration for a generation of insurgents to launch a strike against the Capitol. It’s all out war. Complicating matters is that Peeta — now rescued from being under the influence of the enemy — has been brainwashed into thinking his beloved friend is the source of society’s ills. The action had been stretched pretty thin in Mockingjay – Part 1, so expectations were that this is where the excitement would be. Yet there appears to be even less of that this go around. 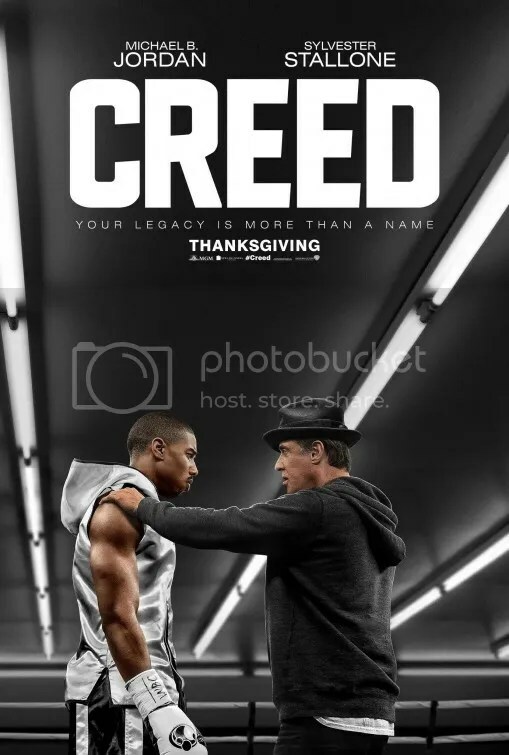 It’s more dialogue as actor squares off against actor. Sutherland and Moore impressively seize the focus. Unfortunately though the plot is a tedious slog in which the sum total of the narrative can be reduced to “Let’s go kill Snow”. There is an exorbitant amount of time spent on just walking to the Capitol. The trek includes Gale (Liam Hemsworth), Peeta (Josh Hutcherson) and Finnick (Sam Claflin) among others. On their way, Katniss and her team confront various traps and threats. A lot of people die. Katniss is disgusted by war and apparently herself. She’s glum and depressed, racked with guilt as she struggles with her new role. She never asked to be a symbol for the rebellion. The depression zaps the actress of her usual spark. Her despondency seeps into the overall spirit of the film. The Hunger Games series ultimately sputters to a weak and sorry conclusion in this fourth and final installment. What a comedown from the exhilarating high point that Catching Fire had achieved. Mockingjay – Part 2 is a dour condemnation of war where very little of consequence happens until the end. The drama fails to make a lasting impression. There are a few exceptions. Katniss and her team encounter mutant zombies whose mouths resemble piranhas. The “Alien” attack sequence is the single most nightmarish moment in the entire picture. The chronicle is once again abetted by a colorful ensemble cast. Tigris (Eugenie Bondurant), is a former Hunger Games’ stylist, briefly seen hiding Katniss’ unit in her shop. The bizarre surgically altered cat woman is like some futuristic descendant of Jocelyn Wildenstein. Regrettably those loopy flourishes are the exception. A mostly gray color palette complements a boring narrative with a sluggish pace. At least it’s finally over I suppose. Movies concerning the cultural assimilation of an immigrant into American life are rare. Nostalgic period pieces about the experience are rarer still. Into this atmosphere comes Brooklyn. In stark contrast to the current zeitgeist, it’s like a invigorating breath of positive air. That’s not to say her new country is a bed of roses. However opportunity does exist for those with an indomitable resolve. The drama is a paean to the spirit of new beginnings, a fresh identity in a foreign land. It’s unapologetically old fashioned and I mean that in the most grand, romantic, heartwarming sense of the word. On paper, the plot is perfectly ordinary. Eilis Lacey is around 20 years old and living in 1950s Ireland. Things could be better as her life has become stagnant. She journeys to the U.S. searching for better opportunities. Eilis deals with simple problems: the boat trip across, her accommodations in America, starting a new job, going to school, the people she meets, homesickness. A chronicle so straightforward, the sum total of which could be summarized in 2 sentences. The relationships she develops and her conflicting feelings regarding her past and her current experience come into play. I won’t spoil with specifics. We’ve seen this material before. What makes Brooklyn so affecting is the fully realized portrait of American life, as seen through the eyes of an outsider. The entire composition is rather profound. Brooklyn is based on the 2009 novel of the same name by Irish author Colm Tóibín. The screenplay is adapted by Nick Hornby (About a Boy, An Education) and directed by John Crowley (Boy A). Brooklyn somehow presents the subject in a way that feels innovative and new. The depiction is honest, sweet, lovely and sincere. 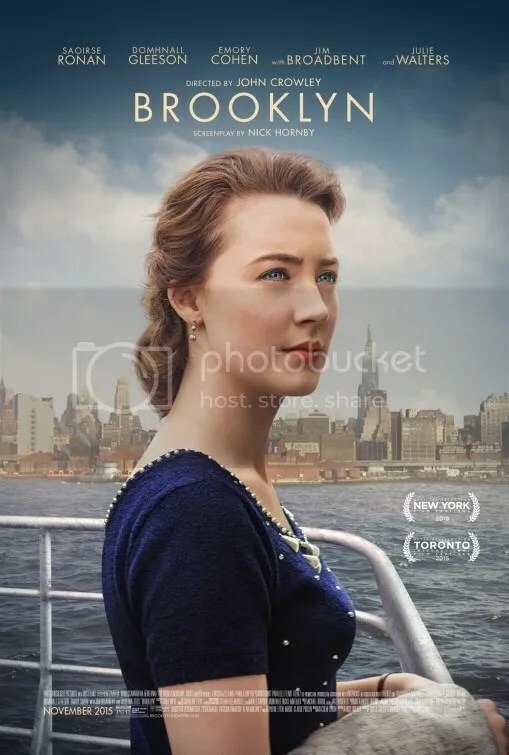 At the heart of Brooklyn is Eilis Lacey, a young Irish immigrant played by Saoirse Ronan. Her talent was famously recognized in 2007 after a supporting part in Atonement for which she received an Oscar nomination. She’s all but assured of another, this time in the Best Actress category. The film’s narrative rests completely on the shoulders of the ingenue. She beautifully upholds the story in every scene with poise and class. She’s supported by a fairly large cast. Emory Cohen, Domhnall Gleeson, Jim Broadbent, Julie Walters, Bríd Brennan all support her in key roles. Every single actor having a chance to shine with their rich performances. But this is Saoirse Ronan’s show and she commands the screen. It has been said that eyes are the window to the soul. Director John Crowley utilizes this to his advantage. Sometimes the camera simply lingers on Saoirse’s expressive face. Her countenance speaks volumes, but there’s also a sophistication just in the way she carries herself. She recalls classic Hollywood with her hypnotic presence. You’ll marvel that this actress is only 21 years old. The maturity of her performance is nothing less than a flawless achievement that elevates the entire film. A Best Picture nomination somehow eluded Avalon & In America, pleasantly optimistic tales about immigration. I’m hoping that changes with Brooklyn. The Peanuts characters have been animated before, but never quite like this. Charles Schultz’ creations debuted as a comic strip way back in 1950 and ran for 50 years until 2000. It continued on in reruns. During those years Peanuts expanded on its success with television specials. A Charlie Brown Christmas and It’s the Great Pumpkin, Charlie Brown are so iconic, they’re still run today. In addition 4 feature films were released between 1969 and 1980. Each relied on traditional hand-drawn techniques. The comics were pitched at adults but the cartoons had a childlike mentality with a nod to adults who might be watching as well. That’s likewise the sensibility of The Peanuts Movie. 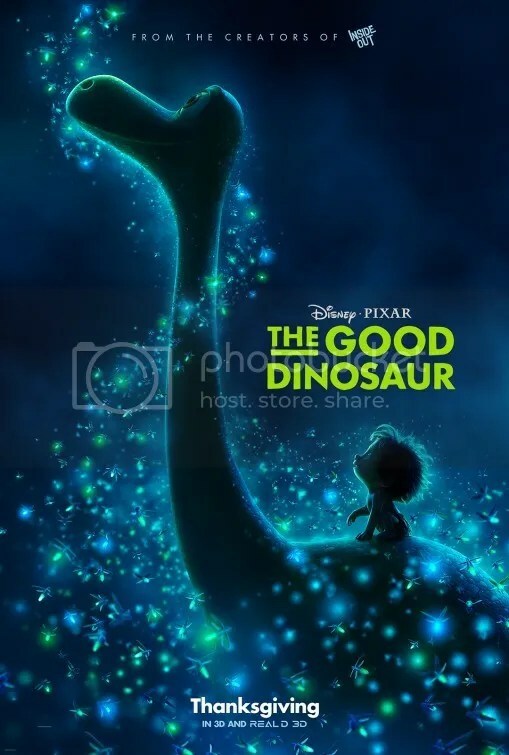 The animation comes courtesy of Blue Sky Studios, the CGI team behind those barely tolerable Ice Age flicks. The artists have done a beautiful job at portraying the gang in this medium. The characters look exactly like you’d expect if they were magically made whole and became 3D designs. There’s a visual depth to these renderings. For example Frieda’s naturally curly red hair and Pig Pen’s dust cloud are so vivid you see distinct strands and dirt particles. It’s the originals you know, only to the second power. Director Steve Martino has had experience turning illustrations into cinematic sagas. He helmed Horton Hears a Who! in 2008. Charles Schulz’s son Craig, his grandson Bryan Schulz and Cornelius Uliano, co-write the screenplay. Honoring a 2D property and modernizing it as a computer animated feature, in 3D no less, is a difficult balancing act. This nostalgia connects people across generational lines. Peanuts have seemingly been around forever so virtually everyone has at least some connection to these kids. Mess with the memory, you mess with our childhood. Despite the visually modern update, the account is a slavishly faithful manifestation of previous incarnations. That’s good news and bad. The positive is the story doesn’t taint the dignity of Charles Schultz’ beloved work. These are the same cherished icons dealing with identical conundrums. Now the dilemma. 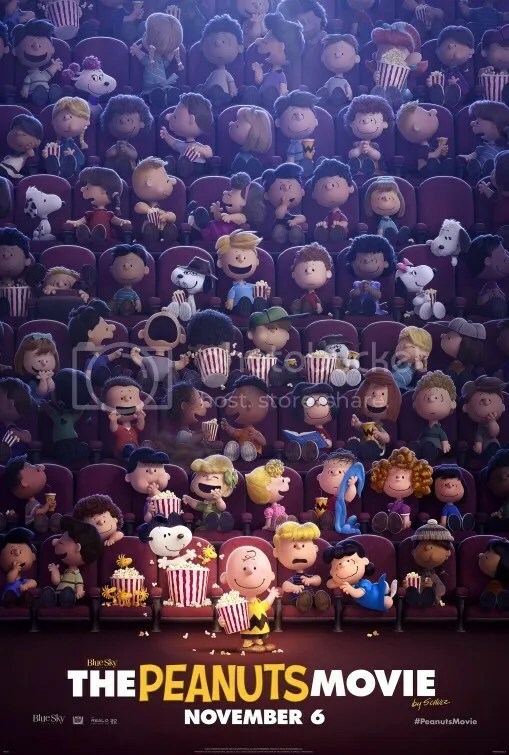 The Peanuts Movie is amiable, but if you’re looking for creativity or imagination, you’re watching the wrong movie. The plot is merely a compendium of replicated gags. Charlie Brown develops a crush on the Little Red-Haired Girl who moves in next door. He wants to make a good first impression. Meanwhile Ace pilot Snoopy writes a novel where he faces his arch nemesis, the Red Baron. He’s supported by Woodstock. The rest of the gang says and does things you remember from past iterations. Lucy dispenses psychiatric advice. Schroeder plays the piano. Marcie calls Peppermint Patty “sir”. Sally pines for her sweet baboo, Linus, who clutches a security blanket, and so forth. They go ice skating and play hockey. There’s a talent show and a dance. Its warm nostalgia and it’s pleasant. The nicest thing I can say is that it honors the source. Yet there’s nothing here you haven’t seen before. Peanuts is a “greatest hits” of recycled vignettes. Its gentle pabulum is guaranteed not to upset the status quo. I was hoping for more. It’s 2 Tom Hardys for the price of 1. That should be the tagline of Legend, the new biopic about the Krays from American director Brian Helgeland (A Knight’s Tale, 42). He also adapts the screenplay from John Pearson’s 1972 book The Profession of Violence. Twin brothers Ronnie and Reggie Kray were two of London’s most notorious gangsters in organized crime. Going from protection rackets and extortion in 1950s to West End nightclub owners in the swinging 60s, they mixed with celebrities and politicians alike becoming personalities in their own right. 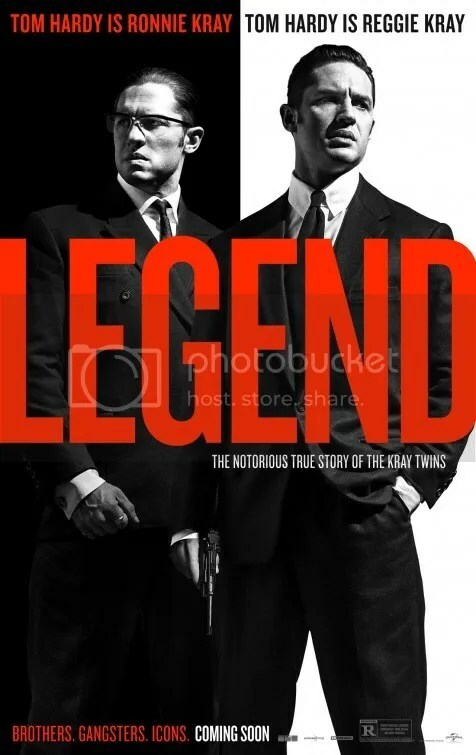 Legend is a fairly entertaining tale that recounts the rise and fall of the Kray twins. Thankfully our chronicle begins with the brothers already in power so we don’t have to suffer through some hackneyed stuff about their childhood. They’re a formidable entity right from the start, instilling fear into everyone with whom they do business. They’re even seeking to expand their bid for supremacy with some mobsters from across the pond. Tom Hardy is hands down the MVP of the picture. He plays both brothers in separately shot scenes aided by the use of some digital trickery. 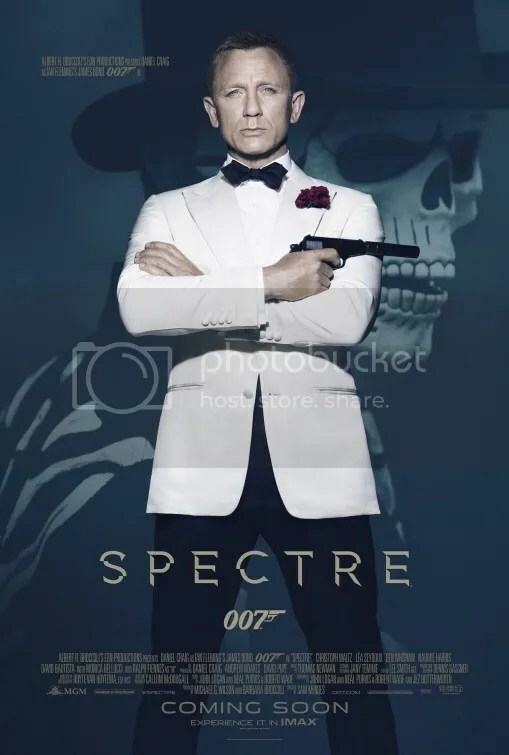 Ronnie is an unstable gay paranoid schizophrenic and Reggie is his equally unstable, but much more suave and debonair brother. Reggie pursues pretty ingenue Frances Shea (Emily Browning), the sister of his driver. As the girlfriend, she is a pleasant girl who ultimately becomes his wife. However the decision to make her the narrator for everything that happens is odd. Having her recount their inner-gangland affairs is awkward since she’s rarely present during those events. It’s a simplistic style choice that trades on an overall lack of depth for beaucoup gloss. Clearly the main selling point of Legend is a pair of gangster performances from British actor Tom Hardy. The scattered and superficial biography is sustained by juicy twin roles that impressively come across as two totally different people. The framework allows for him to really chew scenery in a compelling way. Reggie is by far the better characterization in terms of charisma. He’s a brooding, commanding presence. Impatient Ronnie, on the other hand, is a bit cartoonish. He tosses off intentionally funny one-liners that appropriately induce laughter but also cheapen the seriousness of the rest of the production. Hardy ‘s garbled elocution is actually reminiscent of his portrayal of the supervillain Bane in The Dark Knight Rises. A few of the Krays’ criminal dealings are depicted. For example, the murders of George Cornell (Shane Attwooll), a member of the rival Richardson gang, and criminal hitman Jack the Hat (Sam Spruell), do occur. Unfortunately all too often Legend focuses on the less interesting subject of Reggie’s marriage to Frances Shea. Certainly there is no derth of bloodshed. The account is indeed violent. It’s just that the narrative is fashioned around a triad of performances that occasionally veers into soap opera when it should focus on the twins rule of terror. 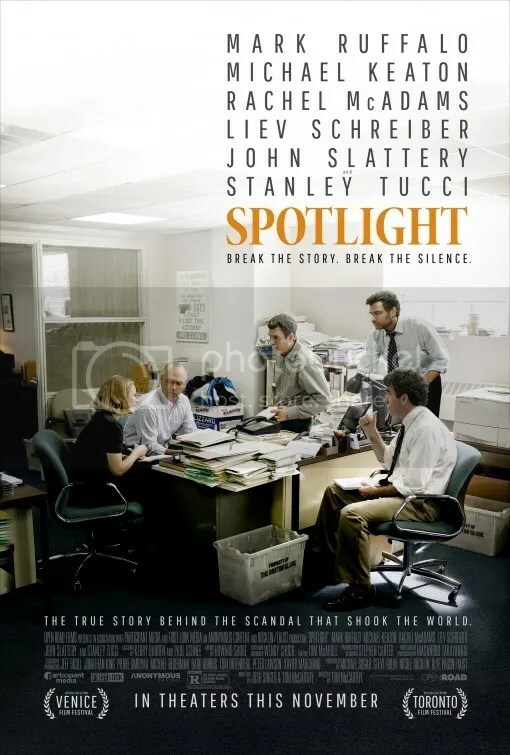 In addition to the aforementioned Emily Browning, Tom Hardy is supported by an able cast including actors Colin Morgan, Christopher Eccleston, Taron Egerton, David Thewlis and Chazz Palminteri. They’re all great, but make no mistake. This is Tom Hardy’s show.